Sancey is located at an elevetion of 177 ft (54 meters) above sea level. It has a population of 1.450. Sancey lies 13 mi (21 km) south of a major highway (right off the l'Isle-sur-le-Doubs junction of the A36 motorway), 31 mi (50 km) east of the regional capital Besançon, and 112 mi (180 km) north of Geneva. 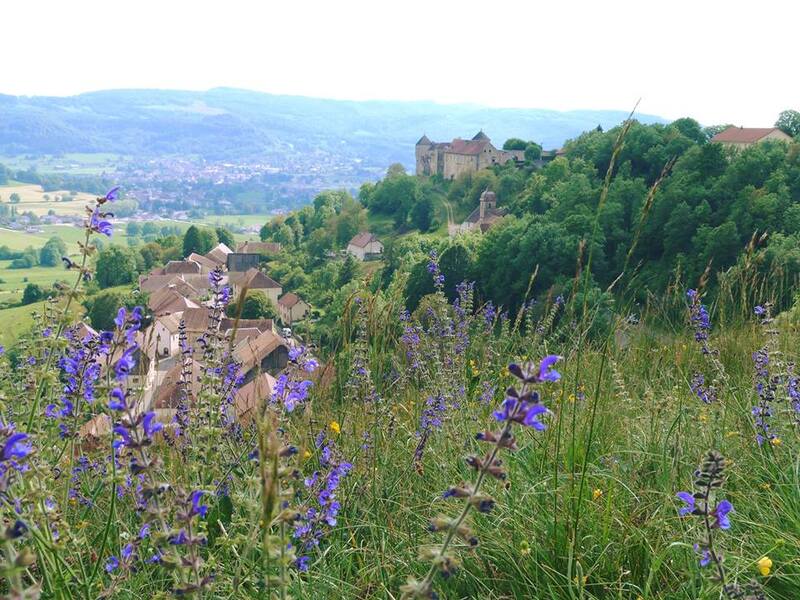 It boasts a religiously significant basilica and will cater to your essential shopping needs as well as let you indulge in some delicious local fare, notably its famous Comté cheese, at several restaurants. Another regional "Franc-Comtois", and local speciality, unsurprisingly, are the cows from whose milk the cheese is made, and whose red and white pied breed is known as the Montbéliarde cattle breed. Here the air is pure and clean, and with all that nature has to offer in the way of forests, fieldsand meadows as well as scenic viewpoints, you will be tempted to engage in any number of outdoor activities, including hiking, mountain biking, and horseback riding. 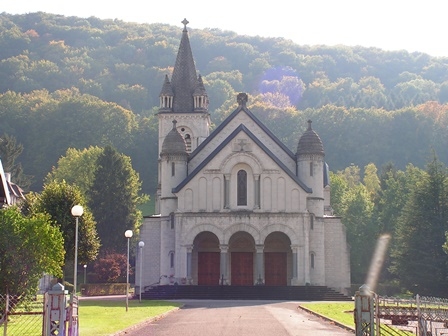 Saint Joan Antidea Thouret (Jeanne Antide in French) was born here in 1765, and both her birthplace and the Roman Catholic basilica that bears her name are now open to visitors. The basilica was built in 1928 in the Romanesque Revival style. Also in Sancey-le-Long you can tour (by appointment) a typical cheese factory, here - as well as in neighbouring Switzerland - known as "fruitière." It makes Comté cheese, which is eponymous with the region (Franche-Comté), as well as Cancoillotte, a runny cheese that is pretty unique to this area although it is becoming increasingly popular throughout France. The "fruitière" has an annual output of over 5,000 cups of the stuff. Opening hours : Mondays 10:00 a.m.-12:00 p.m.
Tuesday to Friday 9:00 a.m.-12:00 p.m. and 4:00 p.m to 6:00 p.m.
Saturdays 9:00 a.m.-12:00 p.m. and 2:00 p.m.-6:00 p.m.
12th-century Belvoir Castle is listed as a supplemental French National Heritage Site. It was built in the early Middle Ages on the site of a Gallo-Roman oppidum. Its majestic hilltop location commands spectacular views over the valley. Taking the tour will let you wander through the various parts and buildings of the castle and chapel as well as enjoy a close look at some beautiful period furniture and other collections. Admission free €6.00, free for children under 12. Go to http://www.chateau-belvoir.com/ for regular opening hours and days (during the Easter-Halloween long season only) and to schedule additional tours by appointment. Besides its mediaeval castle, the rocky hillside village of Belvoir is also noted for its historic market hall with its unique 14th-century wooden architecture. Free guided tours every Friday in summer. Meeting point is right outside the market hall, starting at 4:00 p.m. and 6:00 p.m. Walking and hiking -- the following are marked footpaths that loop back to their starting points for your convenience. Please download the PDF below for further details (French). Trail Route 1 : Belvoir Historic Trail. 12 km. 3 hrs. 30 min. Difficulty level : Easy (yellow and blue marking). Trail Route 2 : "La Baume" 10 km. 3 hrs. Difficulty level : Moderate (yellow and blue marking). Trail Route 3 : Le Dard Viewpoint ("Belvédère"). 16 km. 4 hrs. 45 min. Difficulty level : Moderate (yellow and blue marking). Trail Route 4 : Around Surmont. 11 km. 3 hrs. Difficulty level : Moderate. Trail Route 5 : "Les Hautes Roches" (the High Rocks). 6 km. 2 hrs. Difficulty level : Moderate (yellow and blue marking). Trail Route 6 : Saint Anne's Chapel. 12 km. 3 hrs. 30 min. Difficulty level : Moderate (yellow and blue marking). Trail Route 7 : Surfer's Maquis (WWII resistance fighters' hideout). 14 km. 4 hrs. Difficulty level : Moderate (yellow and blue marking). Trail Route 8 : Lomont Wind Turbines. 13 km. 4 hrs. 30 min. (red marking) and 11 km. 3 hrs. 30 min. Difficulty level : Moderate (blue marking). Trail Route 9 : Trève. 3.5 km. 1hr. 30 min. Difficulty level : Moderate (blue marking), and Lomont. 4 km. 2 hrs. 15 min. Difficulty level : Moderate (yellow marking). Trail Route 10 : Three Fountains. 14 km. 4 hrs. 30 min Difficulty level : Moderate (yellow and blue marking). In the mood for a cross-country horseback ride ? 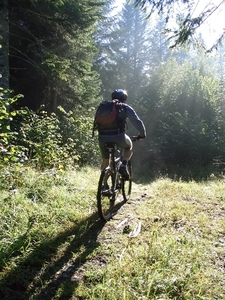 Prefer a mountain bike ride ? Whatever your choice of activities, we hope you have a wonderful stay with us. Welcome to our valley !